The benefits of robotic surgery are that it is less invasive, there is virtually no scarring. It’s as safe as traditional or multi-site gallbladder removal, with the added bonuses of being less invasive, causing less post-surgery discomfort, and providing virtually scar-less results. Dr. Marcus helps patients from West Los Angeles and Marina del Rey determine if gall bladder surgery is necessary. What are gallstones and do they require surgery? Your gallbladder stores and concentrates liquid bile that aids in digestion. Sometimes hard masses form abnormally in your gallbladder called gallstones that may swell and cause extreme abdominal pain. Your doctor may recommend surgically removing your gallbladder if gallstones are negatively impacting your health. Should it need to be removed, there is no long-term negative effect to you other than a few weeks of recovery time. If you have gallstones, they may reveal themselves by causing sharp pain in the abdomen. Gallstones can result in inflammation, and could obstruct your bile duct. Remember, pain is a warning sign telling you to get evaluated by your doctor! Early detection may prevent more serious complications that could include inflammation and/or infection of the gallbladder, bile duct, or serious inflammation of the pancreas that could lead to pancreatitis. Just because you have gallstones doesn’t mean that they have to be removed. Other signs that you may have gallstones are indigestion, accompanied by bloating, heartburn, and gas. You may also experience vomiting and fever and, in some serious cases, a yellowing of the skin. If you suffer from the symptoms listed above, your doctor will likely use ultrasound to determine whether or not gallstones are the culprit. Depending on the diagnosis, your doctor may recommend surgery to remove the stones or your gallbladder. 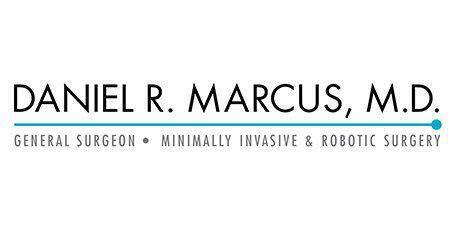 Together, the patient and Dr. Marcus will decide on the best surgical option that will deliver the best outcome. Many patients are asking Dr. Marcus to perform their surgery using the da Vinci Robot. The benefits of robotic surgery are that it is less invasive, there is virtually no scarring. It’s as safe as traditional or multi-site gallbladder removal, with the added bonuses of being less invasive, causing less post-surgery discomfort, and providing virtually scar-less results. The da Vinci Surgical System is a robotic system that translates Dr. Marcus’ hand movements into smaller, more precise ones. This allows for a smaller incision site, a less invasive procedure, and a shorter hospital stay.